The printed collections of the AUEB Library and the Center of Information cover all the academic subjects that the University currently offers and has offered since its foundation in 1920. The collections include about 220,000 volumes and are constantly enriched with new items. To catalogue the printed material, the Library uses the Angloamerican Cataloguing Rules (AACR2). The classification of the printed material is done using the International Dewey Decimal System, according to which knowledge is classified with a numbers system of 000 to 999. The printed collections are housed on the first and second floors of the main building of the University. Users can access the shelves freely. Older material is retired from the shelves to storage areas on a yearly basis and, at the same time, there is a reorganization of the active collections with a corresponding update to the catalogues. All the collections that are in the Library's storage areas - the basement of the main building of the University and the storage facility on Trias Street - are closed-stack collections. Users who need to use old material should advise the Library staff accordingly. The material will be transferred from the closed stacks to the Circulation Desk of the Library for the user who has submitted the request. It will be available within three working days at the most. You can search for printed material in the Library Catalogue (Web-OPAC). The collection of research books is the basic and largest collection of the AUEB Library. The collection is mostly in the English language. The enrichment of the collection is done systematically following proposals and suggestions from the academic staff of the university, so that the collection corresponds to the research requirements of the entire AUEB academic community. Additionally, the collection is enriched with relevant thematic donations The collection also includes PhD theses, essays, studies, reports, etc. The collection is loaned according to the current borrowing rules of the Library. Some items are characterized as "reserved" with a yellow label and can be borrowed on a short-term basis for three days to meet the teaching requirements of specific courses. Old textbooks are retired to the Library's storage facility on Trias Street. Also in that same facility, are old textbooks from the time that the School was founded. Most of the textbooks up until the 1960s have been digitized and are available in full text from the AUEB Digital Library "Pyxida". Users who need to use an old textbook that has not been digitized should follow the same procedure as for Closed Collections. Older editions of the research books are retired to the Library's storage facility on Trias Street. Also stored there are the old and often rare economics books which have been in the Library since the middle of the 19th century. This collection meets the needs of users for immediate information on a specific subject. The collection includes Greek and foreign-language encyclopedias, dictionaries, thematic dictionaries, as well as almanacs, atlases, and others. The informational material produced by the University, such as guides for undergraduate and graduate studies, communication guides, and yearbooks, also belongs in this collection. The items in this collection are labeled in red and can be used on-site only. The items which have been published by the University have been digitized and are available in full text from the AUEB Digital Library "Pyxida". This collection includes books on art, history, and geography as well as literature (novels, poetry, ancient Greek literature, etc.). 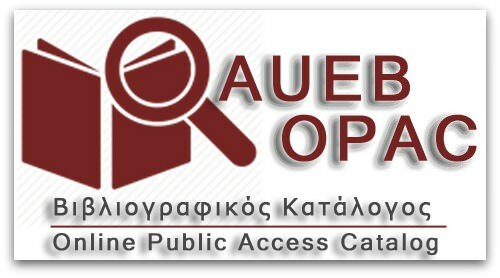 The Library makes every effort to acquire significant works, of great and lasting value, that are published in Greece. These books offer a broader intellectual culture to the Library's users and support the Library's participation in the educational and cultural activities in Greece. The items in this collection have black labels and are loaned in accordance with the current borrowing rules of the Library. They are located in closed stacks in the Center of Cultural Information. Their use is governed by the same procedure as that for the Closed Collections. An exception to this procedure is the series of Ancient Greek literature. This series is located in the Study Room. In the almost 100 years since AUEB was founded, the Library has collected a large number of scientific journals, mostly foreign-language. The journals are especially important for the research, teaching and development of the scientific fields that the University provides. The collection includes about 1,000 subscriptions, in printed format, in English, French, German, and Greek. For decades, these subscriptions were the body of scientific information and research for AUEB and for the broader academic community in the subjects of economics, commerce, business administration, marketing, accounting, management science, international and European studies, statistics, informatics, etc. At the beginning of the decade 2000, the Library followed the developments in new technologies and gradually began replacing the printed journal titles with electronic subscriptions and databases. Today, users at the AUEB Library have access to more than 20,000 reputable and well-known electronic journals. The journals are placed on the shelves alphabetically, by title, in the Journals Department. They can be used on-site only. They cannot be borrowed. Articles in the journals can be photocopied. Every year, all loose issues are bound together so that they can be managed more effectively. The volumes of foreign-language journals, dating from before 1985, are located in closed rolling stacks in the Information and Cultural Information Center. The use of these journals is governed by the same procedure that is in place for the closed stacks collections. Please refer to the detailed alphabetical index of printed journals in the AUEB Library for more information about the journal titles that are in the Library's collection and for electronic access to these titles. The Greek journals that are still being published are located in the same area as the foreign-language journals. The Greek journals form an autonomous collection that is enriched with purchases and with donations from publishing houses, governmental institutions and research organizations in Greece. The volumes of the Greek journals series that are no longer published are on the second floor; access is through an internal staircase in the Library's Journals Department. The latest issues of some Greek titles, such as Marketing Week, with current news and updates are located in the Study Room for the convenience of users. Periodical publications from international organizations such as the International Monetary Fund and the United Nations are located on the second floor of the Journals Department in alphabetical order, by organization. The periodical publications of the Hellenic Statistical Authority - ELSTAT, the European Union EE and the Organization for Economic Co-operation and Development OECD are located in the collections of the corresponding organizations as part of these collections. Please refer to the detailed alphabetical index of printed journals in the AUEB Library for more information about the journal titles that are in the Library's collection and for electronic access to these titles. The daily press - Financial Times, Le Monde, Naftemporiki, and Hmerisia are placed every day in the Study Room for the use of all visitors. Another set of the Greek newspapers is located in the Documentation Centres. The newspapers are withdrawn one month after their publication dates. This collection includes about 7,000 working papers in Greek and in English. It is the grey literature produced by AUEB and by other Greek and European research organizations. The working papers records in the automated Library catalogue are linked, wherever there is availability, to the complete text (access following VPN authentication) and the papers have been retired to a storage facility in the main building of the university. The same procedure that is followed for the use of the closed stacks is followed for working papers, too. The working papers that are not linked to text in electronic format are located in the mezzanine of the Journals Department, in alphabetical order by the organization that has published them and by the year and the number of their publication. The working papers cannot be borrowed. The can be used on-site only and can be photocopied. The collection is made up of statistical series from the Hellenic Statistical Authority - ELSTAT (formerly the National Statistical Service of Greece). These bulletins, yearbooks and monographic series cover all the subject and thematic categories of the country's national statistics since the beginning of the twentieth century. The collection is placed on the shelves by thematic categorization of the Statistical Authority's publications, and then in alphabetical order by title. The collection cannot be borrowed; it can be used on-site only and can be photocopied. The material has been fully digitized and is available in the Digital Library of ELSTAT.